Each block is 10cm deep and the Stargate has 60 blocks. Set out the blocks in a circle to get a general size of the Stargate. The Stargate will be a sculpture created using 60 blocks to represent base 60to connect time and space through a sexagesimal system. 60 parts within an hour and 60, the smallest number divisible by 1, 2, 3, 4, 5, 6, 10, 12, 15, 20 and 30. The Sexagesimal system also measures angles, a sphere of the globe and geographic coordinates. The sculpture will be approximately 2.2 meters in diameter. Think about construction, building methods and Health and Safety issues. I have decided to use Thermalite blocks for the Stargate as that are lightweight and easy to engrave. After a meeting with DJCAD staff and T&M Stonemasonry who are helping build and fit the Stargate, a plan has started to develop. 1 half circle and 2 quarter sections to be manufactured in T&M Stonemasonry’s workshop. The blocks for the sculpture will be glued together to create 3 arches. The Half circle being the largest arch, will take the weight of structure. Each block in this section will be stitched together using steel dowels in every block. The 2 quarter sections will have the blocks glued together. The fitting sculpture to concrete floor will be done by using 2x 25mm threaded dowels drilled approximately 80mm into concrete floor. The dowels will then be set using concrete into the half circle section, fixing circle to floor. 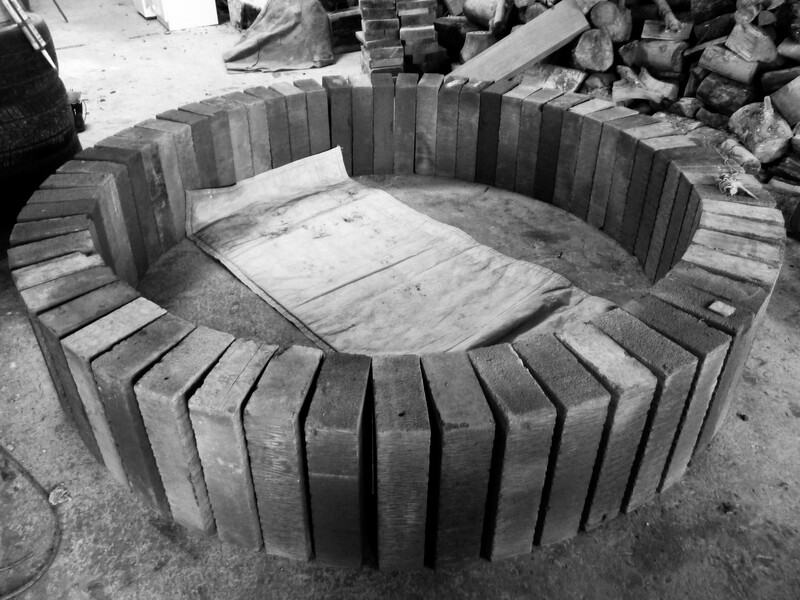 Once secure, a wooden form will be placed within the circle to set the 2-quarter sections. The quarter sections will have drilled holes for fixing dowels to complete the circle. When circle has been securely fixed together, form will be removed and a stability check will be performed. The Stargate will be constructed as 2 arches using a building method first introduced by the Romans over two thousand years ago. They applied this technology to bridges they constructed across the world.My Dad kindly built the support for my Stargate, (thanks dad !) see images below. The wooden frame or bank is constructed in the shape of an arch. The block work will be built up around the frame in sections with the keystone set in position as the last block in the arch. The wood frame will then be removed and the block arch will be left in position. This same arch technology was used on Roman monuments such as the Colosseum in Rome. T&M STONEMASONRY take over ! The Stonemason tests the adhesive using grey Mapei Mapeker Rapid Set which is a rapid set adhesive generally used with ceramics, mosaic tiles, stone or porcelain. Three hours later the blocks are stuck fast ! The blocks are all re-cut to make then all the exact size. The blocks are looking good and I can see my vision revealing itself through the material. The blocks are tested for strength and durability. Next stage involved the blocks being stuck together using the wooden form my dad built as a guide. Day one of install- T&M Stonemasonry arrive. 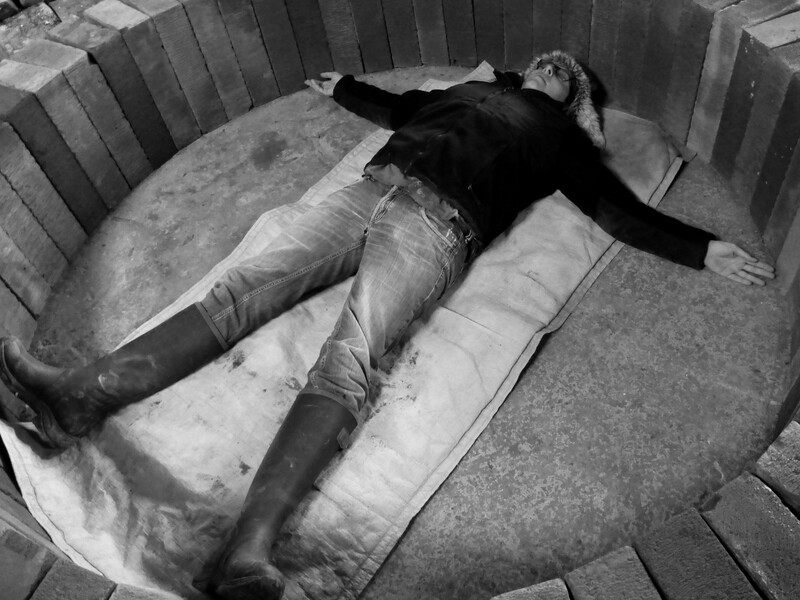 The stonemasons begin work in the studio by installing the foundations of the Stargate. Bolting the bottom section to the floor they start to build upwards using to side forms as support. My morning inspection uncovers two hairline cracks in the structure, after much discussion, it seems that the mortar has set to quickly due to the temperature of the room. I open all the possible doors and windows and the temperature falls. The stonemasons cut out and rebuild the bottom section of the structure.They then place the form on top of the scaffold support. Progress today is slow and gravity is now not on our side, I wonder if we will finish on time. Today is a good day as work moves quickly , the upper section of the sculpture is set in place and the circle starts to take form. The stonemason places the final block into position, now it is up to time and gravity to see if the structure will stand. The graviational pull is now stronger than the structure. Gravity is winning, every secound counts , the more time passes the stronger the structure. The stonemason makes the decision to add extra support, he tells me that it is his job to make sure the structure is sound for health and safety reasons. I feel a wave of sadness as the circle gains legs and I need to find a solution as I feel the legs ruin the whole look of the work. I have to either hide the legs or embrace them as a part of the work. Time is not on my side and I wonder if the structure will still be standing when I arrive at the studio today? Will I finish on time ? Murray and Billy seem very happy with the result , the Stargate is structurality sound and gravity is now on our side .